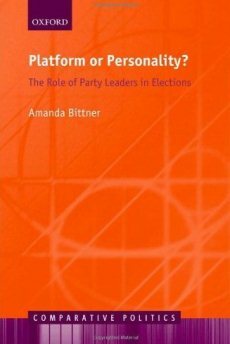 Based on thirty-five election studies across seven countries, Amanda Bittner’s latest book discusses how the personality traits of party leaders can have a bigger impact than the platform on which the party stands. Reviewed by Clara Volintiru. Platform or Personality? The Role of Party Leaders in Elections. Amanda Bittner. Oxford University Press. May 2011. Whether as a researcher or a regular citizen, when faced with the prospect of an election, every one of us is trying to figure out which party or candidate has the greatest appeal or credibility. We thus ponder on the issue just enough to make us feel that we’ve made an ‘informed choice’. But we aren’t always clear on what did influence us more, or what was the basis for other people’s choice. Platform or Personality? attempts quite successfully to clarify these issues, by evaluating the significance of different factors for the electoral decision-making process. The author, Amanda Bittner, is an Assistant Professor at Memorial University, in Canada. This book, as well as her previous work, demonstrates a clear preoccupation with electoral politics. Consequently, she is addressing the classic question of ‘why do people vote the way they do?’. The book highlights one factor in particular, exploring how the personality of party leaders affects the electoral choice. The general idea is that the personality traits of leaders seem to have a bigger impact than the platform on which the party stands. As a political scientist, Bittner offers a careful consideration of the data involved in this study. Thus, it is based on thirty-five election studies across seven countries: Canada, Britain, USA, Germany, Sweden, New Zealand and Australia. This pooling of election studies data sets, spanning from 1968 to 2004, is a vast effort of comparison – both across time and space – directed at achieving ‘a generalised understanding of leaders in elections’. The author’s effort pays out in terms of the incontestable quality of her study and her findings, but it is disputable whether or not we can consider these findings valid for any other country too. Platform or Personality? effectively sums up several important issues related to the electoral process. For example, one of the central points made by this book is that ‘the party label gets applied as a stereotype when voters are confronted by party leaders, and determines (to a large extent) how leaders will be perceived by voters’. In the Introduction, we find an insightful comment on our perception of democracy: “we tend to believe that voters ought to consider ‘higher’ factors like platforms and issues, rather than base, ‘symbolic’ factors like personality characteristics when they go to the ballot box”. As Bittner further demonstrates in the book, it is precisely those ‘symbolic’ factors that weight sometimes more heavily in our decision-making process, as “partisanship and ideology have a greater impact on ratings than other variables do”, while the socio-demographic background characteristics included in her analyses appear to have the smallest influence on evaluations. The book is structured in eight chapters, with the first three building up the premises on which the study takes form, and the final two discussing and drawing conclusions on the findings. Thus, in this pyramidal construction, it is the core chapters that cover the essentials of Bittner’s work on the impact of party leaders, accounting for different vantage points: the voter’s characteristics, the partisanship, and the leader’s characteristics. Through the way the book is constructed, we get a sense of the whole story, accounting for both the impact of voters’ perception, as well as how those perceptions are built up by other factors. But, within the chapters, the story is much less captivating for a non-specialised reader, in the sense that many more questions on political marketing and discourse come up as result of the issues addressed by Bittner. Despite the appetite she manages to create to the reader for more general information on electoral behavior, Bittner remains focused on the evidence she is able to provide based on her data sets. Thus, it is a very solid work that can excite any political scientist, but its general appeal is limited. It could be, in compensation, a very useful read for politicians or electoral strategists. This review was originally published on the LSE British Politics and Policy blog on 18th December 2011. Clara Volintiru is a PhD candidate in Political Science, in the Government Department, at the LSE. She has an MSc in Comparative Politics, also from the LSE, an MBA from CNAM, and an undergraduate degree in economics. Her thesis is focused on political parties in new democracies, but her research activity has also covered topics from the wider area of political economy or conflict studies. Read more reviews by Clara.